Food Memories | Let There Be Food! In no particular order, here are some of my most prominent food memories. Check back often for updates. Please enjoy and feel free to share your own. Happy reading! I didn’t eat scrambled eggs for the loooongest time when I was a child/early teen because of an unfortunate incident at my uncle’s house when I was…younger than 8. I didn’t want to eat the scrambled eggs I’d been served for breakfast (I forget why not.) but I had been told I could not get up from the table until they were eaten. I don’t think I knew that eggs got cold, hard, and overall really unfortunate when they sit on your plate for too long. Eventually I gave in and choked down the eggs so I could get up. Halfway between the table and the sink, I definitely vomited my eggs all over the kitchen floor of my mean uncle who’d goaded my father into making me eat those eggs. Sure showed him, didn’t I? Ha! I’m pretty sure it was 8th grade before I ate scrambled eggs again courtesy of a friend who promised me that she made the best scrambled eggs ever. Now I’m a scrambled egg eater, every time. While there are lots of variations of spiced tea, the version that my family adores actually has very little tea in it. My sister has been working on modifying that in order to bring the sugar content down, which I support. It’s a juice/nectar/tea mixture that is kind of thick, has a spicy bite to it, and will soothe what ails me, every time. We made it all the time when I was little. There was a red Dutch Oven type pot that my mom used every time. We would drink it the first night it was made and then any leftovers would go in canning jars or a pitcher and into the fridge for a mugful before school the next morning. There was a point when we thought the recipe was lost and there was a touch of panic between all of us. Thankfully my sister found it and all is well with the world again. While I don’t have a specific memory date of this beverage, drinking it always makes me think of winters growing up, the holidays, and good times with my family. Don’t worry – when it gets cold, I will post the modified recipe on here so you can share in the deliciousness. LB: Karen, you want some hotcakes in the morning? LB: How many you think you want? Ruth: Now, LB, you leave her be. She just got here. LB: Well, I just need to know how to prepare. I like to know what to expect to eat. Karen wanders into the kitchen, just having woken up. LB: Karen, how many hotcakes you want? Three to start? Ruth: LB, let her wake up first. *Magically, three pancakes appear on my plate. I eat them. LB: You ready for some more, maybe 2? Karen: Yes, two more please. Ruth: LB, don’t force her to eat more than she wants. Honey, you don’t have to eat those. Growing up, my dad was always making his own salsa. I don’t really remember the process happening; I just remember the jars of salsa appearing in the fridge. Once, in the same 24 hr period, my mom made spiced tea (see above) in the same pot my dad had used earlier to make salsa. We couldn’t figure out why our spiced tea was so dang SPICY this time around. We were putting it in the freezer to try to cool it off, which makes me laugh at how silly we were. It took a long time before we put 2 and 2 together. Oh porous pot – you make good salsa and then ruin perfectly good spiced tea. In 1997, my dad gave all three of the kids salsa for Christmas. He bought massive quantities of vegetables, and we spent the day making and canning salsa. Jill chopped onions because she was the only one who could chop that many onions without dissolving into a puddle of tears. Each one of us walked away with our customized flavor profile in 12 jars plus one jar of super extra spicy. It was pretty awesome and our 12 jars lasted each of us several years. Making roasted chicken is a relatively new concept for me, as it’s one that I just picked up since moving to Miami. However, in the holiday season of 2013 my family came to visit. My brother and his wife came for Thanksgiving and my mom came for Christmas. Both times we made roasted chicken for our entree and it was so simple and so delicious. The skin is crispy and flavorful. Not one bit of the bird is overcooked, thanks to a leave-in meat thermometer. It was oh-so-good. I’m pretty sure that every time I eat roast chicken from henceforth, I will think of my first holidays in Miami. Ha, Ha! 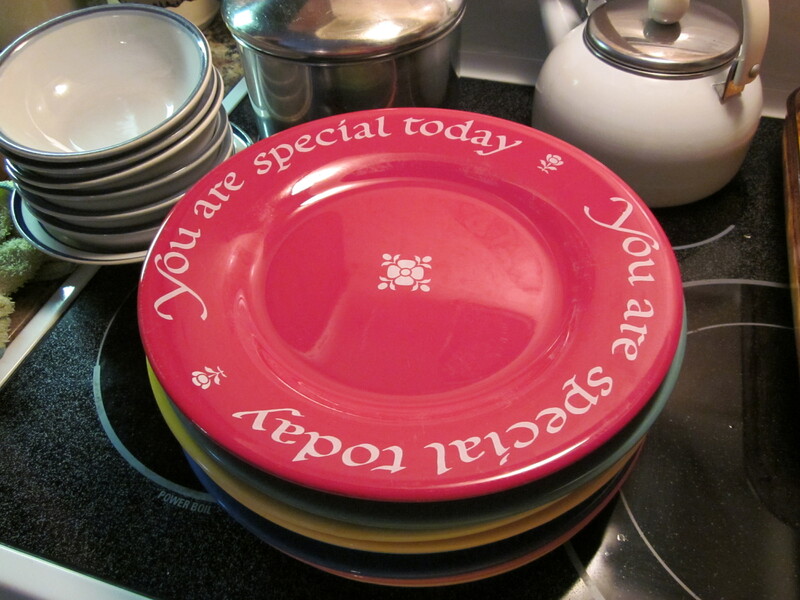 I grew up with those You Are Special Plates and my mom still pulls them out for birthdays. Love them!